I ran out of shelve storage room. I recently bought a scroll saw and I had no place to store the blades and the tool used to change the blade on the bottom. I also recently bought a Kreg pocket hole jig kit and wanted to try it out on a project. I decided to design a small workbench with storage shelves and pegboard that I could set by my scroll saw and router table. 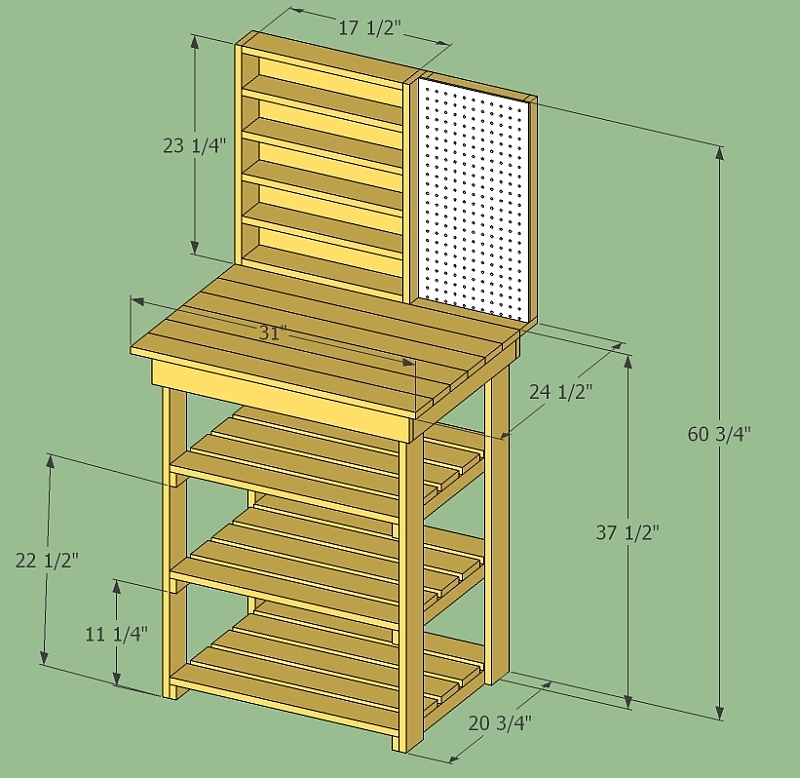 I designed it to be built from 1x4 inch pine except for the small pegboard. I plan on using the Kreg pocket hole jig to make the solid top, and the 4 corner frame the top sets on. To make the top, I sawed 1x4's to length, then used the table saw as the joiner. You saw the right hand side of the board with the fence on the left side of the blade. You also saw the left hand side of the board with the fence on the right side of the blade. Any vertical angle error of the blade with respect to the table is cancelled out and you get nice surfaces for joining. I number or letter the boards to keep them in the correct order. If you do not have the Kreg jig, you can use conventional drilling and doweling to join the boards. The clamp helps to assure the final screwed joint has the two boards with flush surfaces. Here are all the boards screwed together. I did not use any glue on the top. The 1x4's were wide enough such that I could pocket drill the holes in line with each other. If the boards to be joined were narrower, you would have to offset the pocket holes so they don't interfere with each other. Once the top was screwed together, I used the table saw to saw both ends again to make them perfectly flush. I belt sanded the top to make all boards flush. I routed the 4 edges with a round-over bit. I decided to make this work bench so it could be dis-assembled into smaller pieces. I bolted the 4 legs to the top, and bolted each shelf to the 4 legs using 5/16" diameter bolts. I marked the height of the shelves on the 4 legs. Then I clamped wood blocks on each of the 4 legs to support them while I drilled the 4 bolt holes in the legs. 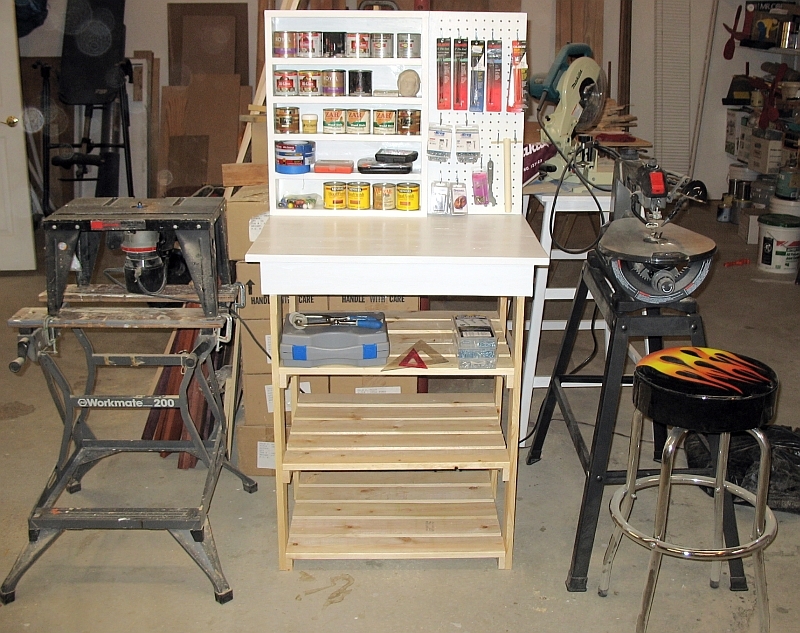 I used the Kreg jig to make the two 4-sided frames for the top shelves and pegboard frame. I used the Kreg jig to drill the shelves also. I did not want to buy a whole 4x8 foot sheet of pegboard, so I drilled all the 1/4" holes in a piece of 3/16" plywood to make my own pegboard. It only took 5.5 hours to build this bench (not counting painting time). I was impressed with the Kreg pocket hole drilling jig on this project. You can build a tabletop and immediately assemble it to the balance of the table if you want to..........versus waiting overnight for glue and dowels to dry. This table makes a nice place to store my scroll saw and router relating tooling items. It took about 13 boards of 1x4 pine, a little 3/16" plywood, and 16 bolts/nuts/washers. Total material cost was less than $50. Anchoring this small workbench to a wall or pole will give it much more stability than in the free standing mode.